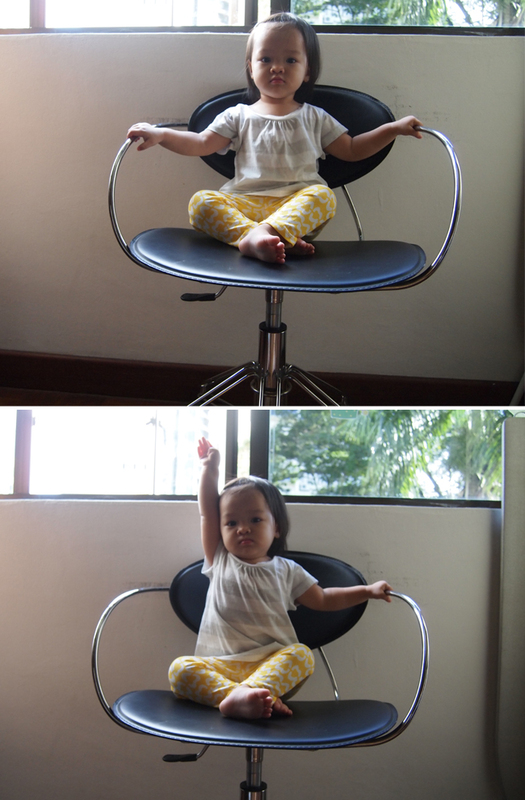 Hello Little Sunshine - Singapore Parenting and Lifestyle Blog: Kaitlin is 20 months old! 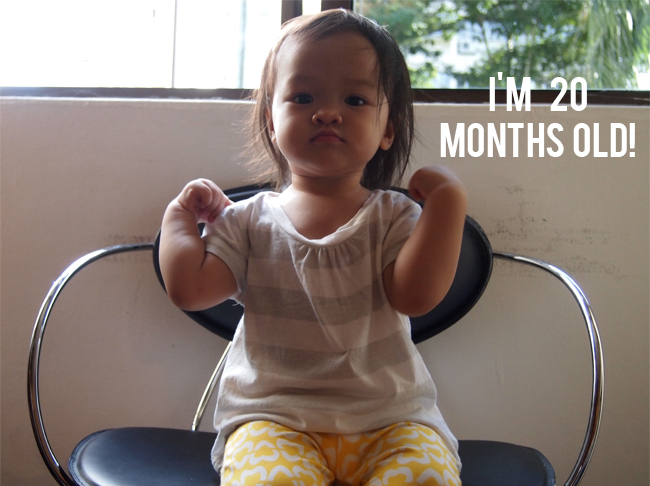 Kaitlin is 20 months old! Wow! Kaitlin is now the big 2-0..well 20 months that is. 4 more months till she turns 2!!! Quite exciting, but also please stop growing so fast my little one. It's been one crazy month! Kaitlin is in her terrible twos stage. Yes, I know she started when she was 18/19 months old..but well, some start early, some start late and some don't even have that phase. I tried to believe the saying that there is no such thing as the terrible twos and its just a phase where they can't communicate their wants/likes and dislikes/frustrations etc, but well sometimes when I reach the breaking point, it's really quite hard to believe that. 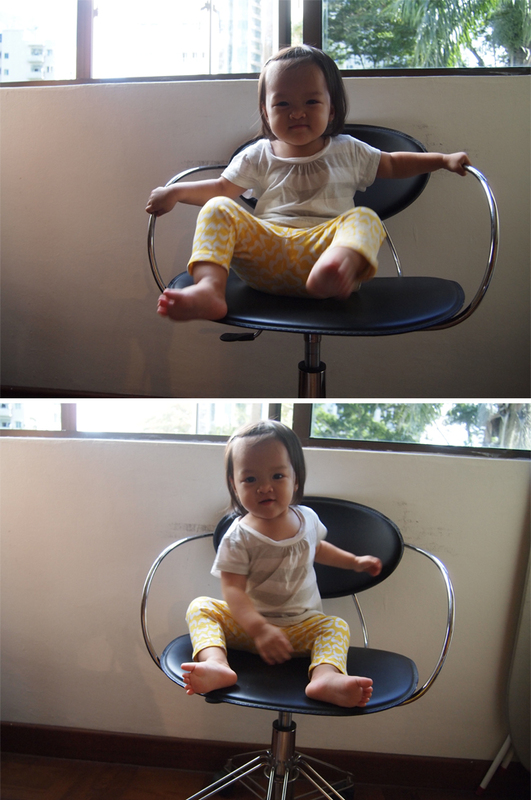 Still, I am trying my best to control my temper and teach her to do likewise as well. I did manage to stay scream free for a week but that was it. If you think I'm a terrible mom cos I scream..all I can say is wait till you become a mom cos all moms will know what I mean..unless of course you don't look after your child and outsource the help. Then good for you! Kaitlin has started to babble quite abit more than usual. Now she can say dog, bird, bread, bag, hi, bye bye, papa, baba, mama, ai ni, bao bao, milk, bubble, ball, door, more, mat, dark, wow, my bag. pronounce the /c/ sound. She also says snake as "nake". She can recognise the objects above and will start saying ball, bird, dog etc. She can successfully walk up and down the stairs on her own. Though outside, she is still not that confident of climbing the stairs on her own. Loves to run and jump. Through some of the Shichida classes she's been attending, we find that she is quite observant and can tell the difference between two similar images and choose the correct one that was flashed earlier on. She has taken a liking to reading books, by bringing us more and more books when we are reading. Though she is still very active and walking about sometimes during story telling time at home, but we hope she's listening. 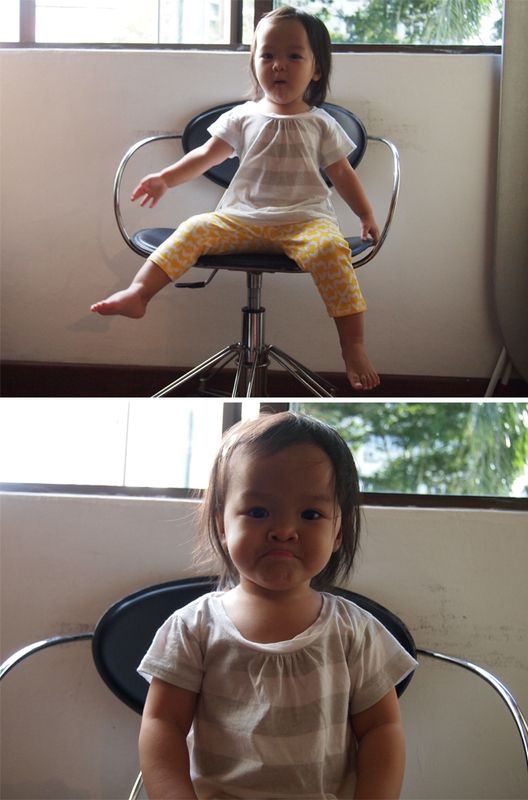 Her tantrums are still quite bad. She loves to look at her school's communication book and look at pictures of herself. Her fine motor skills are quite good. She is able to insert one straw into another, and can peel off stickers. Can identify body parts such as eyes, nose, mouth, head, hair, tummy and toes. Knows how to throw away rubbish and where the dustbin is at. She knows how to open the rubbish bin with her foot as well. I've noticed that she's much taller than she used to be. Maybe she had a growth spurt or something! That's pretty much it most of it. 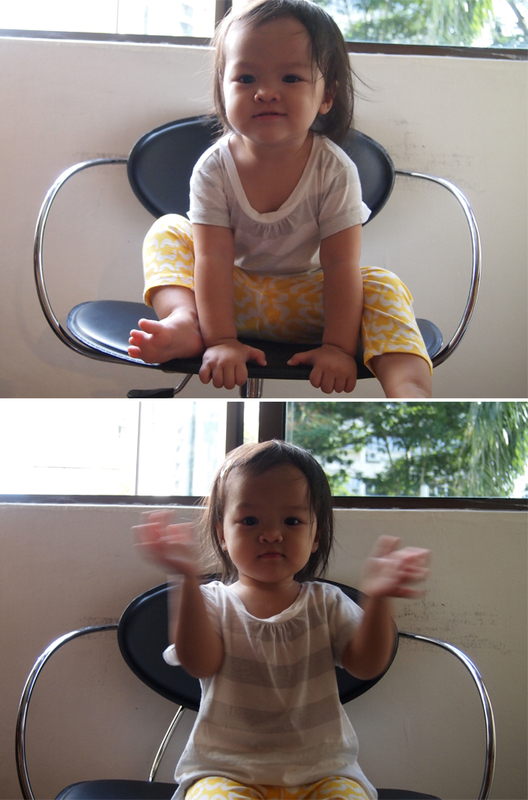 I'm definitely hoping that there will be less tantrums from her, and that the next month will be a good one. I'm of course gonna try and stay scream free for two weeks and hope that I can reach that goal and perhaps more but we'll see. To my dearest little sweetheart, in all honesty you can really be quite the tyrant, but just writing this post has made me so happy, especially looking at the photos! Despite how badass you can be, recalling all your antics the past month has made me feel like the luckiest woman being able to watch you grow up everyday. Yes, that baby who's laughing away one minute, and then screaming hysterically cos mommy doesn't let you lick the spoon that has dropped on the floor. I love you so much you fiesty little girl. Well, just cos I love you doesn't mean we don't have to work on your attitude anymore, we still have to but I'll promise you I'll be there every step of the way :) Big tight hugs and a million kisses for you!